Imagine what quality you could bring to light in your country, in your community, if trust in life, peace and love flow through you rather than fear? Explore deeply nature in you and around you, as way to full self expression, connection to your heart and unique development of the human potential, as a way how to create together the World with tolerance, multicultural spirit, peaceful coexistence and cooperation. Brno Connected opens the door for the innovative, intensive, 8 days long personal development training course for youth workers, trainers and all those called by deep natural connection with self, coming from Bulgaria, Croatia, Czech Republic, Italy, Macedonia, Latvia, Lithuania and Romania. yourself, from inside – out? If you fueled your soul with real food? 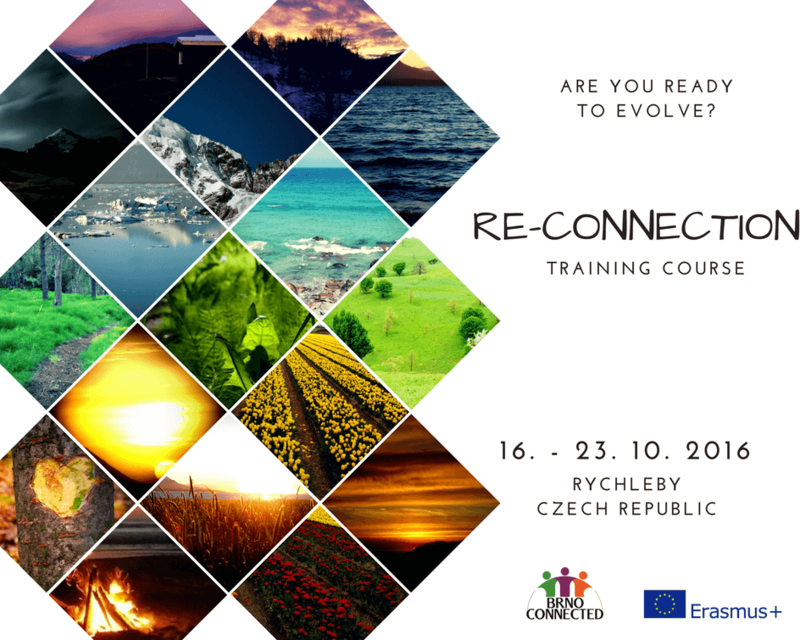 “Re-connection” is an 8 days training course that will take place in the Czech Republic, in the remote, cozy mountain cottage and tee-pee, in Chalupa Ondrejovka in Rychlebske mountains, near Jesenik, from 16th till 23rd October 2016. Tap into your intuitive guidance and reconnect powerfully with yourself within the Re-connection journey. Explore the ancient wisdom of 4 seasons, natural elements and directions, honoring the nature, ceremonies, quality me-time, feminine flowing approach in leadership, many ways of self=expression, change-making power of communing, wilderness in you, intimacy, lightness of wandering. Open heart widely and nourish your mind, body and soul through pure melting in to the arms of vast mountains, grasslands, forests, rivers and lakes in Czech Republic. We aim to bring together You, international youth workers, trainers or simple individuals strongly interested in this topic, with different cultural and personal backgrounds, in order to build up strong multicultural cooperation, inclusive spirit and to explore nature as a key to quality of life, to tolerance and peace, to personal freedom, and as an innovative tool to work with self-development, self-expression, cultural tolerance and inclusion. Take your seat in a circle. enormously, as on its own it transmits peace, focus on the present moment, and invites us for self-reflection and disconnection from outer influences. Nature is tolerant and respectful of all differences, therefore we chose a natural setting as the most convenient environment to learn from and start social change. Inside out. Our approach brings together our soul wisdom, our life journey experience, intuition and knowledge in the field. Teachings from Native Americans, sharing circles, connection to 4 directions and seasons, transformation natural ceremonies; combined with methods of non-formal education, personal development Synergy method tools, coaching, outdoor experience, self-expression, spiritual and mindfulness practices, mind-body-soul techniques, will serve us in exploration, how to reconnect with our nature and unique potential. We will guide you through this journey, we will hold a safe space for your discoveries and learning.